Hello, hikers, and welcome. This page will be my ongoing attempt to track what is going on with hiking trails in the Columbia River Gorge and how they were (are) effected by the Eagle Creek Fire of 2017. Some of the burned area in the Gorge. The Forest Service has now evaluated 67 of the 90 trail miles in the burn area. The Historic Columbia River Highway through “waterfall alley” – including access to several very popular hikes like Wahkeena Falls, Horsetail/Triple Falls and the lodge at Multnomah Falls – still has no planned opening date. In addition, massive changes to traffic and parking patterns on that road are also being considered. Benson Bridge at Multnomah Falls — yay! Wyeth Trailhead and only a small segment of Wyeth Trail that connects to Gorge #400. The remainder of Wyeth #411 is closed until the junction with Green Point Ridge Trail (#418) on the Mt. Hood. The latest Forest Service update is here. 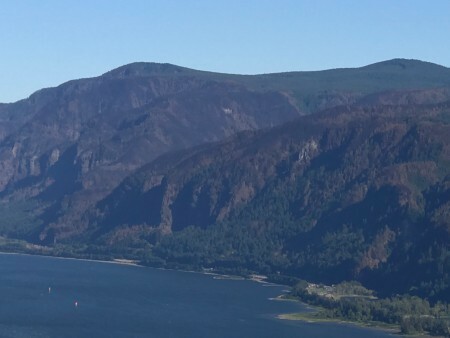 Columbia River Gorge National Scenic Area alerts. The Scenic Area’s general fire update page. The current Fire Closure Area. Friends of the Columbia Gorge has a great list of other places to go hiking. Friends of the Gorge news updates. The Field Guide at OregonHikers.org is always an amazing resource.